This week marks one year since getting into the worst accident of my life, ending my travels in 2017 and starting a long healing process. On October 17th, 2017 I was involved in a Tuk Tuk accident. I have been putting off writing and sharing the story behind the motorcycle accident because of it’s dominance on my life these past 12 months. I didn’t want to have to think about it anymore, never mind share the story. As I sit on a long bus ride from San Miguel de Allende to Mexico City, with my girlfriend Emma, I can’t help but think about it. It’s been a year, and I am lucky enough to be traveling again. The memories of last year’s accident, or really what I’ve been told about the accident invade my mind. A song by The Ballroom Thieves starts playing in my headphones during the bus ride, and the reminders of the accident flood back. I had recently discovered the band, and had been listening to them constantly in the days leading up to the accident. To comfort me in one of the ambulances we took, Emma played them on repeat as I was strapped down to a stretcher, in a neck brace, crying, not knowing what is going on. I was choking on blood and repeating the same phrase over and over, asking what happened, why my head hurt and where my friend Josh was. At the time, I had it in my head that it was 2013, not 2017, and I was on my first adventure in Thailand with him. Memories of that day are difficult for me to recall, so Emma has had to sadly describe the night and what happened to me quite a few times. I am so thankful that she was not hurt like I was, and that I was not alone when it happened. I’m struggling to remember some of my 2017 adventure with her and of course the days, weeks and months following the accident have become an incoherent blur. Before getting ahead of myself, here’s the beginning of the story, and why we were in Thailand. After spending about 4 months in Bali, Emma and I headed to Malaysia and traveled a bit around the country. Knowing my mom was coming to visit Malaysia in a month, we decided to skip a few destinations and instead head to Thailand to Koh Lanta. We wanted to go to a co-working space to work on our projects and enjoy the sunshine, beach and cheap prices of Thailand. Late in the evening we arrived in Koh Lanta from Malaysia to our booked bungalow, had a quick meal and called it a day. The next morning we woke up early, excited to check out the beach and the so-called awesome co-working space. Unfortunately after exploring the island a little we were met with disappointments. The beach was littered in trash and the co-working space we’d read about was in the process of moving to a new location, making it almost impossible to now access it from our booked bungalow. We spent the day weighing our options. Should we head to the other side of Thailand in hopes of better beaches, head back to Malaysia for a better co-working space or just stay in town? After spending the day feeling a little down on Koh Lanta, we decided to head out for dinner to give it another chance. As we walked down the main road deciding where to go, a Tuk Tuk stopped and offered us a ride. In hindsight we both had bad feelings about the driver, but got in anyways. As soon as we got in the driver was driving erratically all over the road, much faster than the other Tuk Tuks. Barely a minute into our ride, our Tuk Tuk collided head on with a turning motorcyclist. We were both thrown from from the Tuk Tuk, Emma flying onto the street into oncoming traffic and I flew face first into the motorcycle we had hit. Emma found me unconscious on top of the broken motorcycle, laying beneath the also unconscious driver. The driver awoke almost immediately, unfortunately I did not. I laid there for minutes not responsive to any of Emma’s techniques of seeing if I was okay. As I lay unconscious a crowd began to form, and someone called an ambulance. I woke up as it was arriving, completely lost and confused. From Emma I know my mouth was bleeding and I was asking a lot of questions as to why I was in pain. Emma helped me stand up and I immediately fell back down to the ground. Emma got me up again and seated on our Tuk Tuk while the ambulance was parking across the street. Her, along with two Canadian nurses who stopped to help, then carried me across the street to the ambulance. One rode with me to the clinic, while the other took Emma back to our hotel on her scooter to get our credit cards and our passports, unsure what was going to happen next. As soon as Emma got to to the clinic, they were preparing to transfer me to a regional hospital to get a CT scan for my neck and brain, as I did not know where I was, or what year it was, still thinking it was 2013 and asking for my friend Josh. I recognized Emma but I did not know that her and I had been traveling together for the last 8 months. 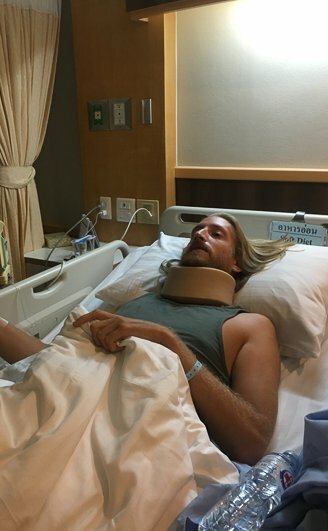 After Emma organized my clinic bill, I was put in a neck brace, secured loosely to a stretcher and we were loaded in an ambulance to take us to the regional city of Trang, a ferry and 3 hour drive away. Though I don’t remember the trip, halfway through we swapped ambulances on the side of a busy highway, switching to the Trang hospital’s care. 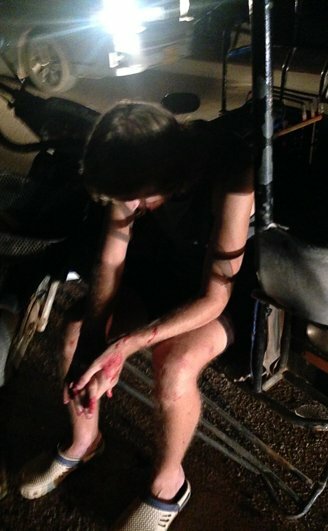 Most of the ride I was choking on blood, but the paramedic with us didn’t care about what was happening. According to Emma he was just sitting on his phone playing Candy Crush. Emma ended up taking cotton balls to help soak up the blood pooling in my mouth, and she grabbed towels to put under my head, which was not strapped tight enough to the stretcher, just bouncing against it in sync with the bumpy road. She spent those 3 hours answering my repeated questions, teary eyed and stressed out, taking care of me the best she could. The next few days are a blur and without Emma I don’t know what would have happened to me. She took care of all our paperwork, called my family and dealt with the doctors and all of the staff during my stay in the hospital. 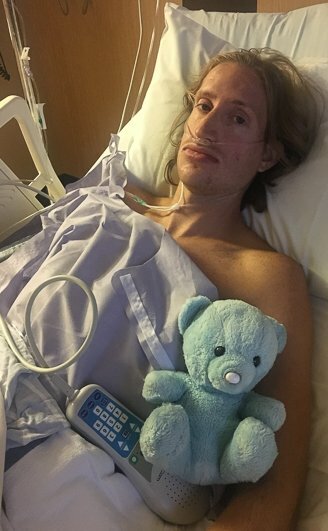 I had CT scans for my neck and brain, x-rays for my face and other parts of my body, IV’s given, blood taken and other things that I cannot recollect. It was determined I had broken my jaw in a few places, had a severe concussion and hurt my ankle. The most pressing concern was my jaw, and the doctor suggested we schedule surgery immediately, now with it being over a day after the accident. Emma handled most of that decision, speaking to my family, a hospital back in the United States and our travel insurance company, trying to determine whether I should have the surgery in Thailand or to fly home. The decision was made to have the surgery at home and in 24 hours Emma managed to find us flights home through our travel insurance, file the appropriate paperwork with all the doctors and get us medically cleared to fly. The following morning I was discharged from the hospital and taken to Krabi Airport, 2 hours away. 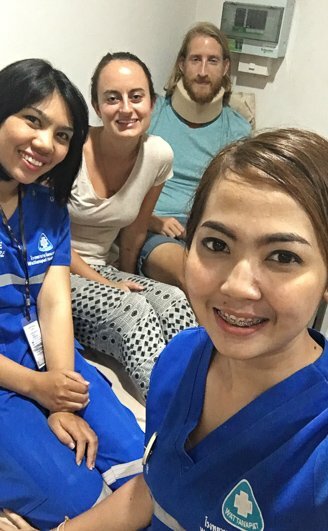 Unfortunately all of our belongings were back in Koh Lanta, so Emma left me at the airport medical clinic and traveled the 6+ hour round trip back to get our things. I spent over 7 hours alone in the airport medical center, drifting in and out of consciousness in disbelief about the accident. We’d arrived to the airport around 11am, Emma returned with our bags at 7pm and we waited for our midnight flight. 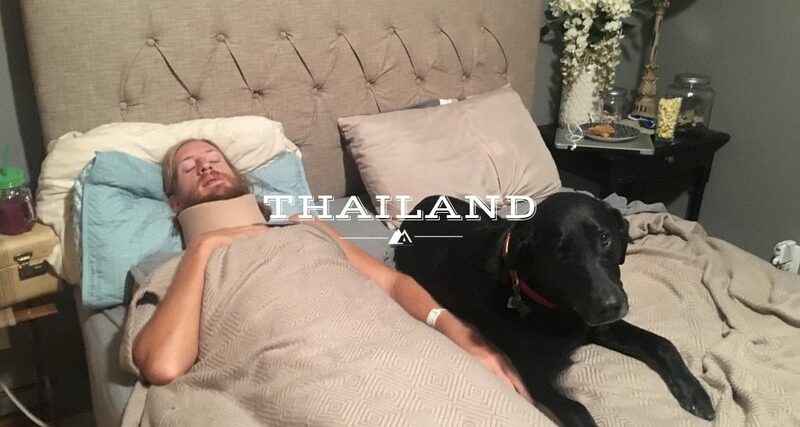 The next journey was 36 hours long and it took us from Thailand to Shanghai to Chicago to Minneapolis to Bismarck, where I immediately went to the ER to fast track an appointment with a jaw surgeon. I arrived back home on a Friday night and had jaw surgery on Monday. I broke the center of my jaw, clean through from my teeth downward and the left mandible, completely across, unhinging it. I had my jaw wired shut for almost two months to ensure both areas healed correctly, and had two plates permanently screwed into the front part. The surgeon thought about and decided against putting a plate on the left mandible, as it would’ve left a 3 inch scar and potentially hit a nerve and losing feeling in that area of my face. Luckily everything healed well being wired shut, with only a slight jaw swing as the only noticeable effect after the surgery. Now a year later I have most of the feeling back in the front of my face and most of the muscles around the lower jaw are working. I still have pain on the side of my face and of course through the front and every now and again I catch myself feeling the screws along my lower lip. After having braces in middle school I had been intermittently wearing retainers at night while I sleep. Thankfully Emma grabbed them, when she grabbed our passports and wallets, before arriving to the first hospital. The following days after the Tuk Tuk accident I put in and wore my retainers full time. They helped immensely with my injuries. 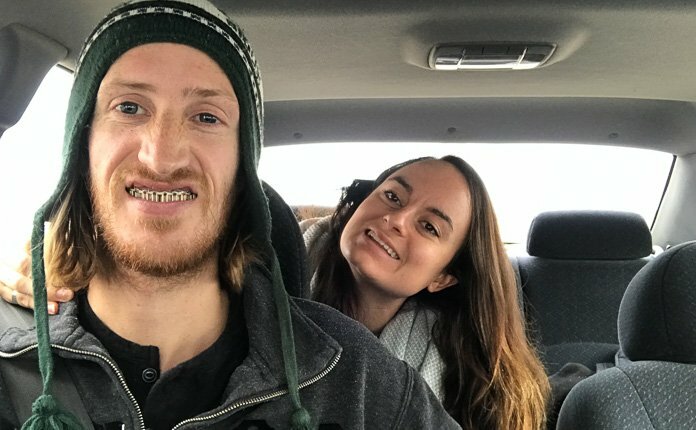 The retainers held together my loose teeth and kept my jaw from drifting further apart during those few precious days coming home from Thailand, before I got into surgery. Along with the broken jaw, I also cracked and chipped a few teeth, tore my Achilles tendon, developed a pulmonary infection in my lungs, hurt my back and damaged some nerve endings along my side. The memory loss has mostly faded, along with the scrapes on my body from the accident and a year later I am feeling healthy and happy to be traveling again. I am forever grateful and thankful to have my family’s full support throughout this past year but healing was a difficult time for me. This injury not only effected me physically, but it brought on depression, anxiety and a feeling of wanting to be alone. I did very little over the winter and spring whilst healing, other than reading novels and secluding myself. And as I now enter Mexico City, on a crazy bus, I still have triggering moments of fear, but I am focused on passing these and continuing to live life to the fullest. Trying to smile for my check-up appointment to see if I get my rubber-bands off!